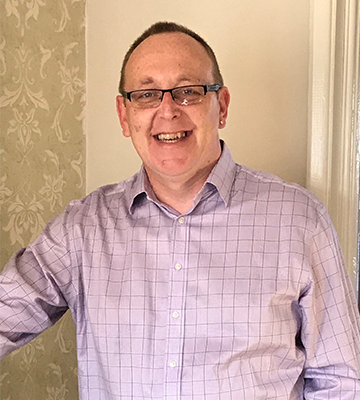 A pancreatic cancer survivor from Yorkshire, Simon Vickerman, is appealing to members of the public to be aware of the signs and symptoms of pancreatic cancer, following his diagnosis three years ago, by taking part in a national awareness campaign. 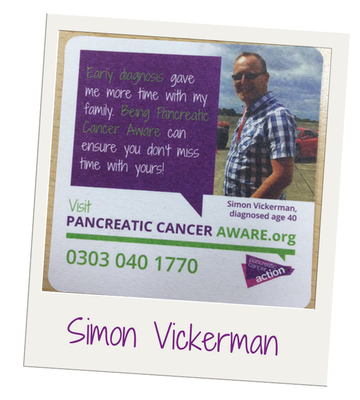 Simon, 43, has teamed up with charity Pancreatic Cancer Action to raise awareness of pancreatic cancer for Pancreatic Cancer Awareness Month, which takes place every November. By appearing on beer mats and sharing his story on the charity’s Pancreatic Cancer Aware website he hopes to show that early detection of pancreatic cancer can have a positive outcome. Pancreatic cancer is the fifth biggest cancer killer in the UK and nearly 10,000 people a year are diagnosed with it. The disease has the lowest survival rate of all common cancers at just five per cent, which has barely changed in almost 50 years. Pancreatic Cancer Action is committed to working towards earlier diagnosis of the disease so that surgery, currently the only cure, is made available to sufferers. The charity funds research into early diagnosis, provides medical education programmes and launches awareness campaigns. If you would like to find out more about the symptoms of pancreatic cancer please visit our symptoms page. If you would like to read more patient stories please visit our patient stories section of our website.